View from the LHENA tent at Open Streets on Lyndale Ave.
It’s been an interesting first two months on the job as a LHENA Board Member. Many blog posts have gone unwritten, while others have been drafted only to remain unpublished. Some observers have speculated that I’m saving material for a political autobiography (rumored title: Eyewitness to Power: God, Guns, Grits, Gravy, and Screenshots). But really, it would be a disservice to my constituents if I stopped doing the communicating that helped me win a landslide tie for sixth place. Of course, I’ll have to modulate my tone. For example, I may start using phrases like “my esteemed colleagues” as a way to soften the blow felt by my esteemed colleagues when I dismiss their ideas. Comity before comedy, I always say. 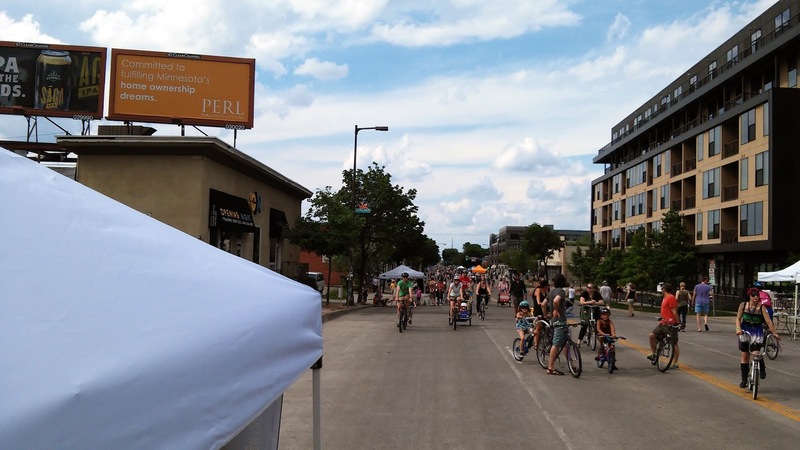 At last week’s Board meeting, I heard from a colleague that the planned 29th Street makeover was met with an unenthusiastic reception at the LHENA tent at Open Streets on Lyndale. I’ve also heard that the neighborhood has been ignored, and that the process for seeking public input has been inadequate. I felt this was too silly a point to bother bickering over at the time, but just silly enough for a blog post/constituent update. The Open Streets comment was a surprise to me, as someone who worked the LHENA tent that day. 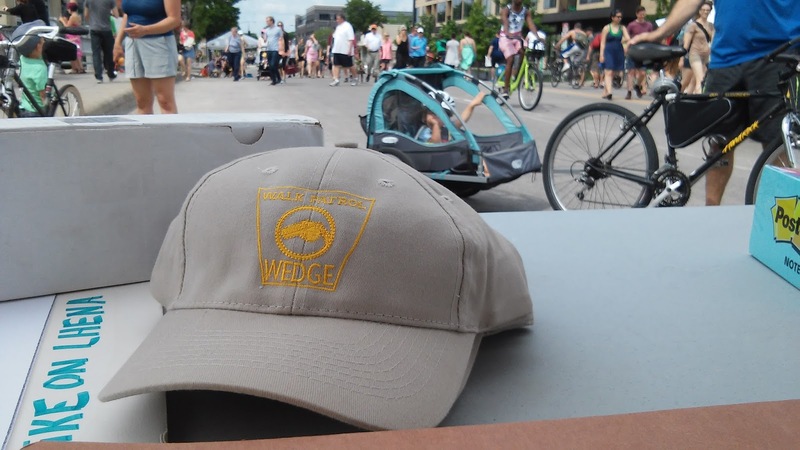 The first thing you should know about the experience at Open Streets is that LHENA’s big, beautiful, professional-looking “Wedge” banner had everyone thinking we were the Wedge Co-op. I spent a lot of time providing customer service to shoppers in search of food items with names I have never heard before (fundraising opportunity for next year: Cub foods at Wedge prices). We did finally come across a young woman claiming to be a resident. She was so enthusiastic about getting involved with her new neighborhood. In the excitement, I immediately gave her a “Wedge Walk Patrol” hat, without checking ID or making her play a silly game. After she departed, we noticed the address she left on the signup sheet was in the Lyndale neighborhood. She’s probably somewhere right now impersonating a member of the Wedge Walk Patrol, making unlawful arrests. Seen a Lyndale resident wearing this hat? Report her to the Wedge Walk Patrol. Then there was the surly mom who seemed to hate everything we were doing. She had a hugely negative reaction to all the options on our Mueller Park survey, one of which was “staffing the pool so babies don’t drown.” If we’re using the feedback we received at Open Streets to draw conclusions, our primary takeaways might be that hardly anybody knows who we are, and Wedge moms have a deep hatred for all things LHENA (not a scientific survey of Wedge moms). So while feedback may have been sparse, the suggestion that a bunch of Open Streets attendees are skeptical of remaking a pot-holed mess into something attractive, useful, and pedestrian- and bike-friendly is odd. As is the idea that this has been forced on us, under the radar. Though I won’t deny, at multiple LHENA meetings over the last 12 months, I’ve been put to sleep by Lisa Bender’s relentless droning about 29th Street, leaving me unable to remember key details of her secret plan. There’s been plenty of time to bang the drum if anyone thought the neighborhood’s concerns for 29th weren’t being addressed. There were three public meetings last year (I walked to two of them from my home; other LHENA honchos were there as well). Aside from complaints about process, I’m not sure what the substantive objections/critiques are. If you happen to have any, there’s one last meeting scheduled for June 29th.